Cross cultural marriages are their own kind of special, but this one was next level! Believe us when we say that. Shot brilliantly by the team at Fotografia 9, with every picture captured in all its glory. 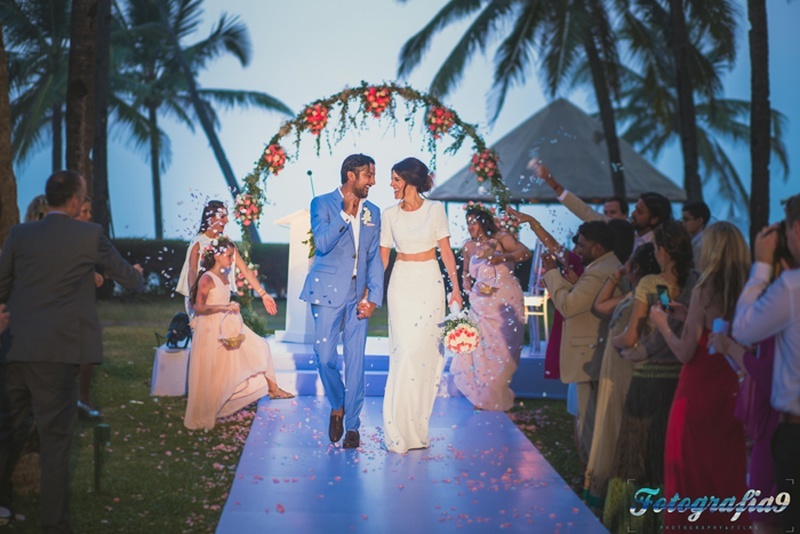 A two day celebration with each in its distinct taste and style – first came the uber colorful full desi sangeet and then the elegant Christian wedding. “This wedding had us wanting and praying that all our weddings this year should be like this one! Because and apart from the love, joy and celebrations that we experienced and captured, this was also our first (almost) "Unplugged" weddings! One where everyone really participated in the experience of the wedding, instead of capturing it with their mobile phone cameras!” – The Team at Fotografia 9. The sangeet + pre-wedding party was all things colorful and ethnic – one you wish you were a part of in reality! Blue lit triangular standees, with kandils and globe lanterns illuminating the beautiful night sky. The gorgeous bride-to-be, Jessica looked like an actress straight out of a Karan Johar movie. Dressed in a pink patchwork kalidar lehenga with a maathapatti that will leave your jaw dropped right to the floor. The celebration that began at the pure desi way with dhol-walas, marigold garlands and the grand entry of the bride on a palki continued with lots of naach-gaana and latke-jhatke! We could feel the energy of each guest right through our computer screens – we kid you not! The next day brought with it the tasteful minimilistic wedding of Neil and Jessica. The décor was all things elegant and simple at the nuptials as well as the reception. They took their vows under an arch wrapped in fresh green ferns with pink and white roses adorned beautifully on, and every person attending in similar hues of white and pink. Our absolute favorite bit of this wedding was the brides outfit (like always! Sorry, Grooms ;)) Jessica took a 360 degree flip from the conventional A-line white wedding gown, instead she went for a straight-cut high waist skirt with a half-sleeved crop top. The waistline of the skirt and the hemline of the crop-top had a gorgeous lace that added the perfect touch of elegance to her entire ensemble. Her bridesmaids too were dressed in white and her flower girls in a pretty shade of pink wearing floral crowns made with baby’s breath and blush pink roses. The groom and his gang kept it classic contemporary in their open-collared white shirts and off-white suits. Neil went for a hue of sky blue with well-set hair and footwear that was as dapper as could be. Easy to tell that Neil left no stone unturned in looking his best for the most special day of his life! Little bouts of gold at their reception gave Neil and Jessica’s wedding reception a contemporary twists i.e. the metallic gold L.O.V.E balloon and the “Mr&Mrs” shimmery cake-topper. This wedding gave us all the Pinterest feels and we’re sure it’ll do the same to you. Look at more photos here.